Painting of the Battle of Bunker Hill by E. Percy Moran. Following the battles at Lexington and Concord, the British soldiers returned to the relative safety of Boston. The commander, General Thomas Gage, was concerned about the city&apos;s vulnerable position, lying as it did in the shadows of surrounding hills. The wisdom of securing those heights was considered, but not acted upon. At about the middle of June, 1775 the British officers in Boston waked to the consciousness that "rebel" batteries at Dorchester Heights on the south, or on Charlestown Heights-Bunker&apos;s or Breed&apos;s Hills-on the north, might make the situation of the troops in the town not only disagreeable but perilous. They resolved to sally out and fortify these heights themselves, Dorchester on the 18th of June, and Bunker&apos;s Hill a few days later. Rumors of this intention reached the Committee of Safety, to whom the Provincial Congress had delegated all discretionary powers to regulate the movements of troops, and they proposed the immediate fortification of Bunker&apos;s Hill before their enemy should come out. Around the end of May, a great part of the reinforcements ordered from England arrived at Boston on May 25. Maj. Gen. William Howe, Maj. Gen. John Burgoyne, and Maj. Gen. George Clinton also arrived about the same time. Lt. Gen. Thomas Gage, thus reinforced, prepared for acting with more decision. Gage met with his war council to decide how best to control the harbor and retain access to the sea. They decided that control of the key terrain on Dorchester Heights and Charlestown on the northern side of Boston was critical to their success. The last stop on the British escape route from the Battles of Lexington and Concord was Charlestown. They threw up hasty fortifications but a few days later General Thomas Gage decided he was spread out too thin and withdrew over the Charles River into Boston. It was the first of many tragic mistakes by the Commander in Chief of Britain&apos;s American Forces. General William Howe&apos;s favorite strategy was the flanking maneuver as he demonstrated time and again in this war. Howe had planned to use a breach on the Mystic River beach to flank the Yankee stronghold but now had to change plans because Colonel John Stark had brought his New Hampshire Regiment to the beach and built one of those ubiquitous New England rock walls. His first order of business was to soften up the rebel fence line with an artillery assault. In this he was thwarted for two reasons. Historical Map of the Battle Bunker Hill - June 17, 1775; illustrating Positions and Movements. After retreating from Lexington in April, 1775, the British Army occupied Boston for several months. Realizing the need to strengthen their position in the face of increasing anti-British sentiment in and around Boston, plans were developed to seize and fortify nearby Dorchester Heights and Charlestown peninsulas. The peninsulas offered a commanding view of the seaport and harbor, and were important to preserving the security of Boston. On June 17, 1775 the Battle of Bunker Hill took place. It is one of the most important colonial victories in the U.S. War for Independence. Fought during the Siege of Boston, it lent considerable encouragement to the revolutionary cause. This battle made both sides realize that this was not going to be a matter decided on by one quick and decisive battle. When the British planned to occupy Dorchester Heights on the Boston Peninsula, the colonists became alarmed at the build up of British troops off of the coast. The colonists decided that action had to be taken so as to stop the threatening British movement in this territory to protect themselves from an attack. The Battle of Bunker Hill started when the colonists learned about the British plan to occupy Dorchester Heights. The colonists were understandably shaken by this news. They thought of this as the last straw, and they had to protect their land and freedom. Bunker Hill, battle of, in the American Revolution, June 17, 1775. Detachments of colonial militia under Artemas Ward, Nathanael Greene, John Stark, and Israel Putnam laid siege to Boston shortly after the battles of Lexington and Concord. However, Thomas Gage, British commander in the city, made no attempt to break the siege until he was reinforced (in May) by troops led by William Howe, Sir Henry Clinton, and John Burgoyne. The Continental forces learned of the British plan to take the heights of Dorchester and Charlestown, and William Prescott was sent to occupy Bunker Hill outside Charlestown. The Battle of Bunker Hill took place on June 17, 1775 on Breed&apos;s Hill, as part of the Siege of Boston during the American Revolutionary War. General Israel Putnam was in charge of the revolutionary forces, while Major-General William Howe commanded the British forces. Because most of the fighting did not occur on Bunker Hill itself, the conflict is sometimes more accurately (though less often) called the Battle of Breed&apos;s Hill. The Battle of Bunker Hill, a battle fought in the American Revolutionary War, occurred on June 17, 1775 between the American Revolutionary forces under the command of General Israel Putnam, and the British forces under the command of Major General William Howe. Howe was determined to take Charlestown Heights, overlooking Boston harbor. It was actually fought on nearby Breed&apos;s Hill, when Colonel William Prescott erred and set up his 1200 men at that location and began to construct earthworks. It is considered to be the bloodiest battle of the American Revolutionary War. A misnamed engagement of the American Revolution, the Battle of Bunker Hill was fought between British regulars under Gen. William Howe and New England militiamen under Col. William Prescott and Gen. Israel Putnam on June 17, 1775. 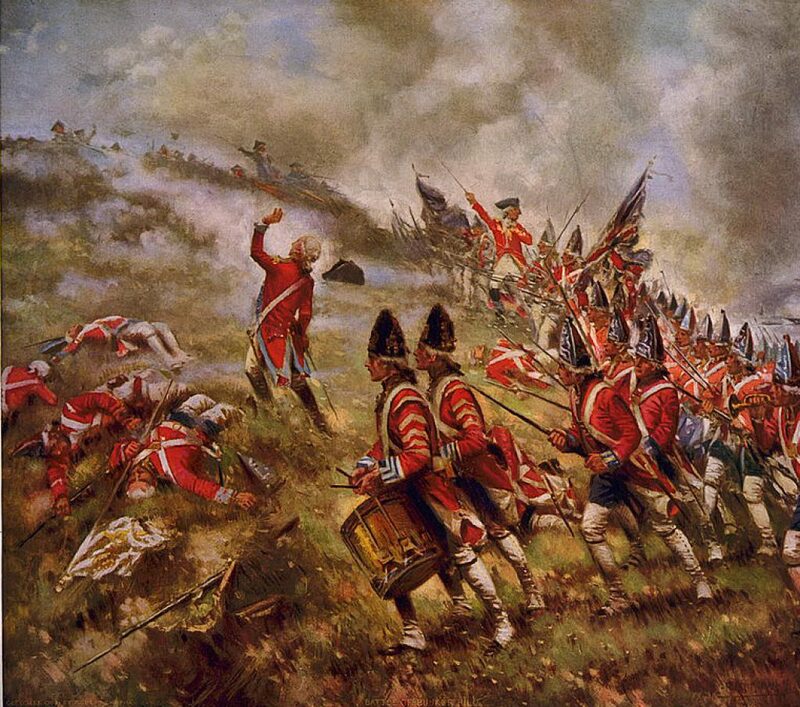 By reinforcements from England and Ireland, General Gage&apos;s army in Boston, at the end of May, 1775, was 10,000 strong. With the reinforcements came Generals William Howe, Sir Henry Clinton, and John Burgoyne, three officers experienced in the military tactics of Europe, but not prepared for service in America. To mark the 225th anniversary of the Battle of Bunker Hill, the Massachusetts Historical Society presents its first "web exhibition" -- personal accounts and eyewitness descriptions of the battle, along with contemporary maps, drawings, engravings, broadsides, and artifacts, either preserved by the participants or found on the battlefield. With the outbreak of the war General Gage, the British commander in chief, found himself blockaded in Boston by the American Continental Army, occupying the hills to the West of the city. Gage resolved to seize the Charlestown peninsula across the harbour. Before he could act, on the night of 16th June 1775 around 1,500 American troops of the Massachusetts regiments and Putnam&apos;s Connecticut regiment occupied Breed&apos;s Hill and Bunker Hill on the peninsula. The American troops began to build a redoubt on Breed&apos;s Hill. The fortification was complete by the morning, after a night of frenzied work. The presence of the Americans on the peninsula was observed by His Majesty&apos;s Ship Lively which opened fire on them. On June 17, 1775 British regulars faced an assemblage of independently minded colonial militia at the Battle of Bunker Hill. By evening of that day the British held the Charlestown peninsula, and a new respect for the determination and resourcefulness of colonial forces. The colonials, if shaken fro m what was for many the first taste of war (and what it reveals of men&apos;s character), had proven to themselves that in direct confrontation they could thwart the British army, a force superior in training, equipment, and organization. The sun was shining from a cloudless sky a little past noon on June 17, 1775 when a British force of 1500 men landed on Charlestown Heights in Massachusetts. Their objective: a surprise attack to nullify the threat posed by "rebel" batteries on the peninsula.